511 buses operate southbound via Dundas, Spadina and Richmond to Bathurst; northbound via Adelaide, Spadina and Dundas. The 511 diversion is extended north to College and Spadina. The 505 Dundas car diverts both ways via Spadina and College to rejoin its normal route at Lansdowne. There will be no service on Dundas Street between Spadina and Lansdowne. The 310 Bathurst Night Bus will follow the same diversions as the 511 daytime service. These photos were taken on October 23 as the new loop was taking shape. Looking north on Bathurst across the loop entrance. Northeast into Wolseley Loop. Off-street loops on corners like this one are now quite rare in the TTC system. Many loops have shifted into subway stations or been lost as the network contracted. “Guerilla gardens” pop up on bits of public property around Toronto courtesy of the neighhbours. Looking east into the loop. This has one of the few remaining “old style” operator’s washrooms (the small green building in the corner). Saw-cutting the end of existing rails to make a clean face for welding to the new track. Looking south on Bathurst across Dundas. Looking east on Dundas across Bathurst. The jog east of the intersection is one of several places where the once-separate streets that now make up Dundas were joined together. Another view east across Dundas. The high rise in the background is the new Aura condo at Yonge and Gerrard. Looking northeast across the intersection with Toronto Western Hospital in the background. 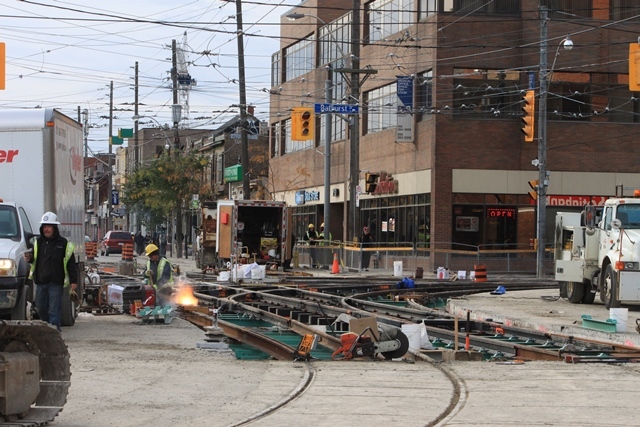 Looking west on Dundas with thermite welding of intersection components in progress. This entry was posted in Bathurst Car, Transit. Bookmark the permalink. Thanks for the photo update. Did the TTC consider, if it is technically possible, converting the Wolseley Loop for bi directional entry and exit? Specifically, cars coming northbound or southbound would enter the loop through Wolseley and have a choice to exit the loop heading northbound or southbound. I can imagine some operational flexibility in such a set up for short turns or service interruptions requiring both bus and streetcar operation along the route. The route could be split among the two vehicle types at/via/near Wolseley. Steve: I doubt that this was considered any more than rebuilding in place. It’s a tight loop and a south to east curve would complicate the geometry of the northbound entrance which never straightens out to an east-west orientation. 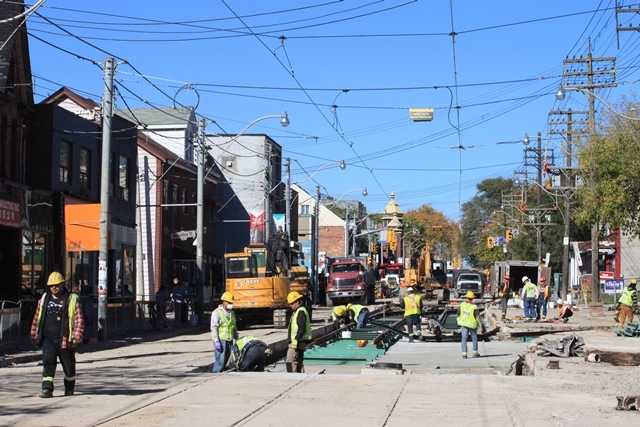 Steve: How is the 512 St. Clair streetcar line being serviced with trams with the closure of Bathurst Street/access to Roncesvalles car barn? Steve: My guess would be via College, Spadina, King. There has been a noticeable amount of public confusion on and around the southern portion of the 511 along the Fleet ROW with respect to the 509 having resumed and the 511 switched to buses simultaneously on October 12th. I had noticed on the first days of service, October 12-14, there were many confused-looking people at the eastbound Remembrance stop who — after a fashion — asked me where to board the Bathurst streetcar, evidently having difficulties with the posted detour notices, somehow to the extent of not even knowing to look for buses. This confusion has gotten better but certainly not disappeared since those first days. It is unfortunate that the TTC does not have the 511 buses run in the Fleet ROW between Strachan and Bathurst — it is such a short stretch but would save a good bit of travel time rather than turning at Fort York and again at Lakeshore, which can be a rather long light, then waiting in the often-busy Lakeshore-to-Bathurst left turn lane, not to mention being much less confusing to passengers — the Remembrance stop for instance gets no replacement bus service eastbound (and westbound only about 20% of operators seem to stop there depending on how charitable they feel) leaving people to look around confused and only eventually wander to Fort York or Bathurst. There is a detour notice at the eastbound streetcar platform at remembrance but it states “board buses at curbside stops” and makes no mention of the fact that there is no such curb at that stop and passengers must head a block east or west. At Fort York it is somewhat simpler but even with the proximity of the two stops at Bathurst I have seen people not realise where the “curbside stop” is for the northbound bus. The Spadina ROW had buses running on it for a longer stretch from Queen to Lakeshore in August as construction wound down, and of course the St Clair ROW has buses running along it daily, yet the TTC avoids running buses on the Fleet ROW east of Strachan as though it would trigger the apocalypse (this was also the case in 2013 during the bus operation due to watermain work all along Bathurst). Is there any reason for this? It does not seem tight at all in terms of poles/curbs, much less so than the nearly-paint-scratching nightmare for buses that is Spadina from Front to Lakeshore, and it looks to me at least to be made of the same solid concrete as Spadina and St. Clair so I’m really at a loss on why they avoid it so religiously given how much passenger confusion+travel time it would save. I love the quick cut saw throwing sparks in the general direction of the gerry can full of gasoline. I guess there isn’t space to put in a northbound exit from the loop. It currently serves as a pretty oddball short turn location, for King and Spadina cars mostly. It’s a bad day on the Queen line if there are short turns at Bathurst! I’m not sure how many Bathurst cars actually use Wolseley as a short turn; not many I suspect. What would be the justification for keeping Wolseley Loop around? I understand it dates back to when the Fleet streetcar terminated there. It’s not much use for Bathurst, since it only allow it to short tern over the least busy part of its route. It’s not much use to King because there is Charlotte Loop now. It’s of no use to Dundas and Carlton because you can’t go into the loop from the north. It’s only a little useful for Queen as a short turn because it is close to the middle of the route and McCaul loop is nearby. I’m sure the land would be worth a lot. Steve: The more loops the better. It is well used. I am told this work is in preparation for the introduction of the new streetcars on Bathurst. What new streetcars? Is there any word as to when they are coming? The strike didn’t last this long and I thought 4404 was ready for shipping before the strike even began. Steve: I’m still waiting on an update from the TTC. This really is getting quite ridiculous. A long time ago, in a galaxy far, far away it seems, the TTC was able to continue running streetcars even while the roadway was under construction. Unlike other single route streetcar cities in North America, the TTC does have alternate routes which they use for detours. However, they still need buses to fill in the gaps. With the current shortage of buses, it does show that the TTC does need to keep a surplus of vehicles around. It’s not enough to have only the bare minimum that the bean-counters hunger for. Both for construction projects and for emergencies. Steve: For some years now, the TTC has diverted service off of track that is under construction. There are two basic reasons for this. First, the roadbeds are being rebuilt right down to the foundation, and that cannot be done under service. Second, the track is built in concrete now, not paving setts, and the concrete does not cure properly with service running on the track. The vibrations affect the space between the rail and the concrete. It is not practical to assemble intersections on site with service running through them because this would require the new and old tracks to perfectly co-exist, and changing out tracks in between cars simply isn’t going to happen. Steve great to see the reconstruction. Nice to see that there is a real commitment to maintaining the network. Would love to see new construction, and extension of the network. Would be great to see a huge increase in service on Queen. Would also be nice to see a real improvement in transit conditions for the car Queen. My fingers are crossed for a derailment free design. Could it be Toronto is becoming a tropical city, with gardens provided by “gorillas”? There IS enough heat (not at all sure about substance) being generated by the current campaign for Toronto’s mayor to create the tropical conditions required by gorillas! Steve: I am not sure what gorillas would think of sunflowers. Steve: Yes, all of the track with regular service on it, save for various intersections (where the upgrades started later than with tangent track), is now completed to the “new” standard. Even for the diversionary trackage, there is not much left. Victoria is on hold because of construction projects. Bay needs to be done. That green outbuilding is a washroom? I always thought it was a utility shed for a water or hydro meter. It looks more like an outhouse than a washroom. I’m not sure how many Bathurst cars actually use Wolseley as a short turn; not many I suspect. Many years ago, when I used to work on the Exhibition Place grounds, I would occasionally spot the odd northbound 511 being turned back at Queen. I’m sure the TTC still continues that practice today. Twice earlier this year, I saw a Bathurst car short-turn at Wolseley on different days at about 1 PM. I thought it rather strange to short-turn there as I wouldn’t think there would be extra demand between Exhibition and Queen. Steve: It’s not a question of demand but of putting the car on time, or, maybe filling a gap. Steve, which line is next for construction? Richmond Street water main work is not yet complete, and so the track replacement has been put off to a future year. The Eastern Avenue project at Russell Yard has been deferred until Leslie Barns opens and operations from Russell can be shifted over to Leslie during the construction period. The intersection of Spadina & College has been deferred. The updated schedule will not be out until the 2015-19 Capital Budget is published early in 2015. Bay St. only has a short section to be done, approximately between Elm and Edward. Why they left that short piece when the track was done from College south or when they did the Dundas-Bay intersection is a mystery. Maybe tied into some City infrastructure project coming up in that area or maybe they just did not think of it! They only have so much money. They could have built Broadview loop instead of rebuilding Wolseley Loop. Steve: Wolseley is maintenance, and I’m quite sure that the folks who think about new track anywhere are a different group. Then again, it is entirely possible that the TTC has forgotten it owns the property for Broadview Loop. The last time I asked, I was met with a “what are you talking about” kind of blank look. I would love to see a steady progressive extension of the streetcar. Better still would love to see an organized drive as to how to improve the speed of certain streets for transit (especially King and Queen). Also need to start to think in terms of eventually having streetcars and basic centre of street ROW in the outer 416, as part of a plan to allow for intensification of transit usage, and integration with RER and larger LRT. Beginning on Sunday, October 12, 2014 – the same day streetcars returned to he “509 Harbourfront” route upon completion of the new Queens Quay West tracks – the TTC replaced streetcars on the “511 Bathurst” route with shuttle buses. The first few days (October 12-19), the shuttle buses travelled on the exact same route as streetcars. Beginning on Monday, October 20, they began to detour – up/down Bathurst, along eastbound/westbound on Dundas, northbound/southbound on Spadina Avenue (‘swimming alongside with’ the “510 Spadina” streetcars), eastbound/westbound on Richmond/Adelaide Street, and up/down Bathurst Street. This setup continues until Sunday, November 2. Beginning on Monday, November 3, There will be a larger detour for the “511 Bathurst” shuttle buses. They will travel up/down Bathurst Street, across College Street (sharing track with “506 Carlton” and also the diverting “505 Dundas” streetcars), northbound/southbound on Spadina (sharing track with “510 Spadina” streetcars), eastbound/westbound along Richmond/Adelaide streets, and up/down Bathurst Street. 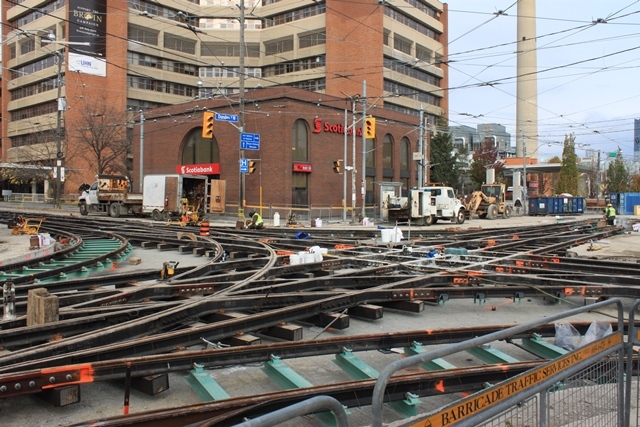 This is because the Bathurst-Dundas intersection will be closed for TTC track reconstruction. What’s being built at this intersection – a “grand union”? The “505 Dundas” streetcar will also detour to avoid the intersection (along College Street). With this construction and detouring, it would take longer for people to get to the Royal Agricultural Winter Fair (November 7-16) at Exhibition Place. 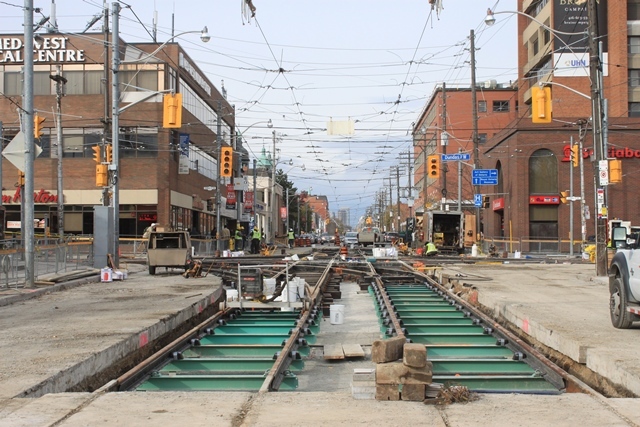 This track reconstruction – and also sewer and watermain work – is necessary to keep the route in a state of good repair – and preparation for the arrival of the new low-floor (Flexity Outlook/LFLRV) streetcars. 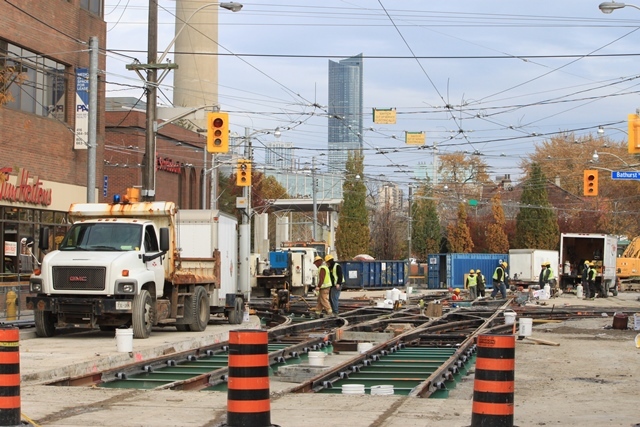 When this construction project is complete, streetcars are expected to return to the “511 Bathurst” route on Sunday, November 23rd – just in time for the One-of-a-Kind Christmas Show and Sale at Exhibition Place (runs November 27-December 7). The new streetcars are coming soon (next year) to this route. Steve: The intersection at Dundas will be rebuilt “as is”, a 3/4 grand union with no curves in the southeast quadrant. David O’Rourke asked: Is there any word as to when they are coming? The strike didn’t last this long and I thought 4404 was ready for shipping before the strike even began. Moaz: Could something have gone wrong once the 2 LFLRVs went into revenue service that requires major refurbishment of production vehicles like 4404 and beyond? There was a comment on the Transit Toronto board that the LFLRVs were temporarily taken out of service because metal debris was found in the Spadina ROW, and there is apparently a derailment risk at Spadina and Queen’s Quay. Perhaps a reader from inside the TTC might be able to reveal some information unofficially? This post on the Toronto Traction by drum 118 says they are fixing issues found with 4400 and 4403 before they ship 4404 and 4405, like the door not all opening on auto. Also they currently only have one rail car to transport the LRVs on. When track construction work is complete, streetcar operation is expected to resume on the “511 Bathurst” route, which has been using shuttle buses since Thanksgiving weekend; beginning the second week detouring on Dundas Street West (and later College Street), Spadina Avenue, and Richmond/Adelaide Street West. Would this track work be preparation for the new LFLRV streetcars when they begin service at sometime next year (2015) on this route? They’d arrive on this route just in time for next years Canadian National Exhibition. The “511 Bathurst” route is a good one for the new streetcars which are longer and have multiple articulations, since this route is at street level for the entire length, from the loop at Bathurst station down to to the Exhibition loop located under the Gardiner Expressway. Steve: This track work has nothing to do with the new cars, per se, but is part of an ongoing program to rebuild the entire system. Were it not for the delay in arrival of new cars, Bathurst would be on the verge of conversion today, and would still face the replacement in the next few years of the intersection at College. Similarly, Spadina is already operating through its College intersection that should have been, but wasn’t, rebuilt, another job for 2015 or 2016. The takeaway from that is Bombardier has never designed rail cars with operator controlled doors before. Steve: You are being ironic here, yes? What day are streetcars expected to return to the “511 Bathurst” route? Is it November 23rd? The Royal Agricultural Winter Fair, which takes place November 7-16 at Exhibition Place is just around the corner. Many people going to the “Royal” would be taking the TTC to get there. This year, like last, the TTC is running buses on its “511 Bathurst” route, and unlike last year (when the buses stook to the same course) this year they’re taking a detour to bet around the construction. It will take just a little bit longer for those taking the “511 Bathurst” route to get to the “Royal”. However, streetcars will return just in time for the One-of-a-Kind Christmas Show and Sale, at the Direct Energy Centre, Exhibition Place. Steve: Yes, November 23. But the Harbourfront 509 service will be running from Union. Wolseley loop is used a lot as the Queen to SB Bathurst track, as one of the two E/W directions (Can’t remember) can’t turn southbound to Bathurst. So they turn north, then loop. Steve: West to south via Wolseley. As an alternative, the “511 Bathurst” shuttle buses could detour, immediately after laving Bathurst station, westward on Bloor Street, southbound on Palmerston Boulevard and/or Euclid Street down to Queen Street, eastbound along Queen Street to Bathurst Street, where (heading southbound) it would follow regular the routing the rest of the way down to the Exhibition loop. They would still be avoiding the construction zone at Bathurst Street and Dundas Street West. It may mean a short hike to Toronto Western Hospital. Steve: Why start the diversion at Bloor when the buses could use College and stay on the regular route at least that far south. In your scheme it would make sense to use Euclid northbound (it is one way) and Palmerston southbound. However, both are narrow residential streets and I’m not sure how well bus operations would go there. All the same, we have seen buses on Brock (Dufferin diversion) and on Huron (Spadina diversion). Along with additional loops, why aren’t additional turns being put in where possible. Completing the southeast quadrant for flexibility’s sake would make sense. Is that link missing because of the jog around Alexandra Park? Steve: The TTC on occasion includes extra curves when it rebuilds intersections, but not reliably. In some case it’s a question of the nature of capital budget planning when they order the track, usually some years in advance of the actual work. Another consideration that would have to be checked on the site is whether there is one or more manhole covers that would conflict with the missing curves. 3.5 KM of Dundas with no TTC service. Kind of makes you feel special. Lot of pissed off older folk. There was a blockage on King last week which necessitated a Bathurst-Queens Quay-Spadina diversion. They were unable to use the much discussed Wolseley loop routing via Bathurst-Queen-Spadina because of this construction. Pardon me if this has already been answered elsewhere but with the TTC streetcar track and network upgrades being completed across much of the network what sort of budgetary relief is the TTC looking at being able to reallocate to other projects? I guess my questions is, how much less will streetcar network maintenance cost now that what was seemingly a rebuild blitz comes closer to a close? And to what is this money being reallocated? Or could you point me to resources which might demonstrate comparative decreases and increases in capital budget allocation. Steve: It’s not quite that straightforward because the annual spending is influenced also by certain one-time projects. A good example of this will be the rebuilding of the south ladder track at Russell Carhouse next year. Things on this scale don’t come by every day. In any event, you can see a summary of the capital budget spending planned for subway and surface track in the 2014 Capital Budget Report Appendix A. The project list stretching out 10 years is not in the main budget report, and only the next five years are detailed in the “Blue Books” holding the full budget (not online). After this budget was published, the City made some cuts to reduce spending on both subway and surface track maintenance over the period 2014-23. It is unclear how much the TTC actually cut back as opposed to shuffling money from other accounts and we won’t have a really good sense until we see the 2015-24 Capital Budget details, likely in December. That was quick. 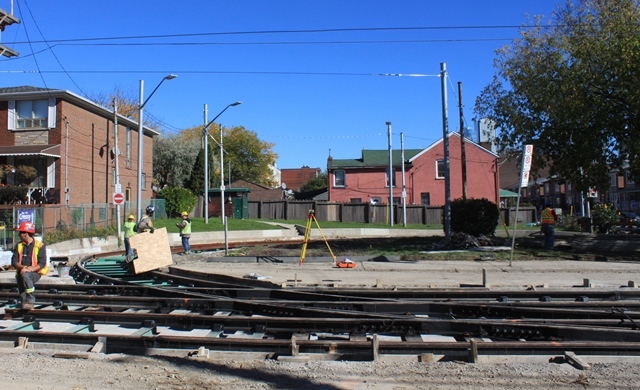 On Nov 5th, they were still excavating old tracks from the Bathurst/Dundas intersection. Yesterday, I went to the Royal Agricultural Winter Fair at Exhibition Place, and took the “511 Bathurst” shuttle bus to get there (and back home). The young TTC representatives aboard the bus gave us pamphlets of the construction, which have a map of the route. Our bus travelled south on Bathurst Street, east on College Street, south on Spadina Avenue, west on Richmond Street, and finally south on Bathurst Street. When travelling along College Street and then Spadina Avenue as far south of Dundas, we’d share track with the “505 Dundas” streetcar which is also detouring around the construction zone. It felt just a little bit weird travelling on Spadina Avenue for part of the journey . The streetscape of Spadina’s quite different from that of Bathurst – it’s wider with more glitz and glam, more ‘touristy’, busier and more people-filled – whereas Bathurst Street has a quieter, laid-back feel and a generally grittier, blue-collar look, a legacy of its long industrial heritage. Also, Bathurst Street has more greenery, ie. Alexandra Park. After leaving the Exhibition grounds, I’d be heading back to Bloor Street on the “511 Bathurst” shuttle bus. It turned to go eastward on Adelaide Street, north on Spadina Avenue, and west on College Street, and back to Bathurst Street. While travelling north on Spadina, I look out the window looking west (beyond the bright neon lights of the stores on Spadina) and see a large sign with flashing LED lights which reads “Bathurst & Dundas Streets Closed” informing motorists not to enter the intersection. There was another of these signs on Bathurst, just south of College Street. 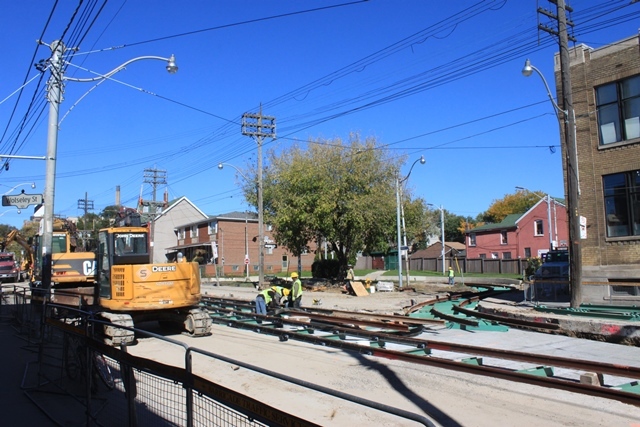 I’m looking forward to the completion of this track construction, and the return of streetcars to the “511 Bathurst” route and also return to regular routing, which is in time for the weekend of November 23rd. That’s just in time for the One-of-a-Kind Christmas Show and Sale, which runs November 27 through to December 7, at the Direct Energy Centre, Exhibition Place. 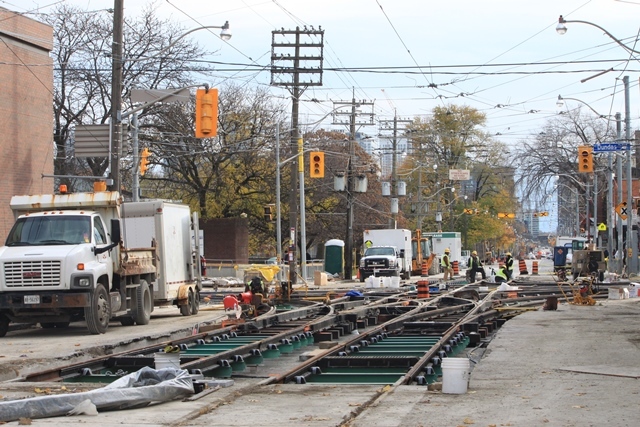 There’s been steady progress in the construction of new streetcar tracks on Bathurst Street, both at the Wolseley loop (which is used for short-turning of streetcars) and the Bathurst-Dundas intersection. Once the new track has been laid, what will happen next? Is it the pouring of concrete? 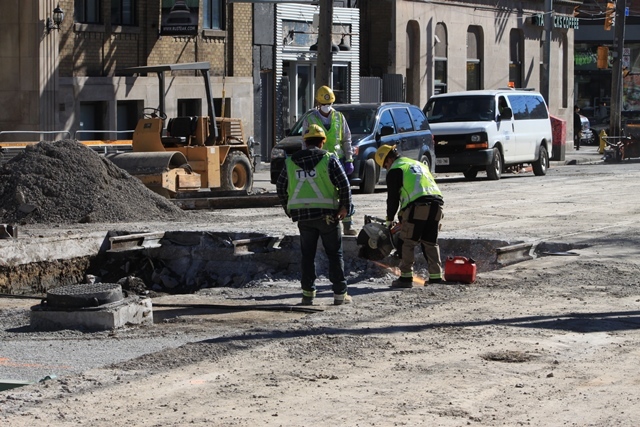 While this work is being done, people will continue to ride the shuttle buses which are currently running on the “511 Bathurst” route. 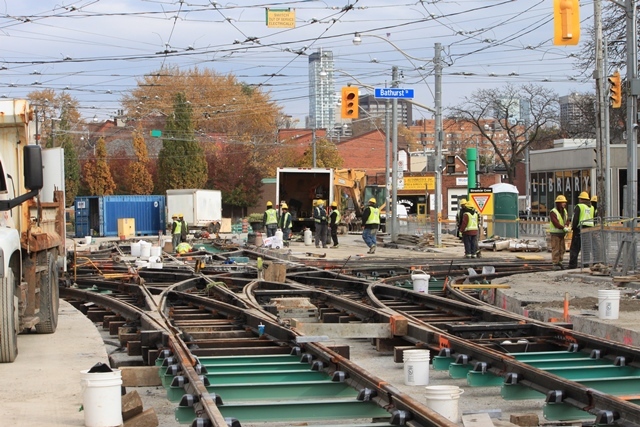 Besides the TTC streetcar track construction, what other work is being done? Is it the replacement of old asphalt on the road? Will there also be replacement of old sidewalk concrete? Steve: The foundation layer of concrete was poured between the demolition of the old intersection and the installation of the new track. I noticed a change with this project in that the entire intersection has been assembled before any concrete was poured around the ties and rails. If this has not happened already (I last visited a few days ago), it should soon. Streetcar service will resume three weeks after the project started. This allows the new concrete time to cure before it has heavy traffic on it. As for related works, according to the construction notice, there will be watermain, road and sidewalk repairs. Steve: Another consideration that would have to be checked on the site is whether there is one or more manhole covers that would conflict with the missing curves. With all of the other work taking place at Bathurst & Dundas, has there been a cost benefit analysis of relocating any manhole covers (it’s hard to tell from Google’s Streetview) to accommodate the missing curves to form a grand junction? It’s a coordinated effort with everything that’s buried under the street, so if any manholes are in the way they can be relocated at the same time. Having full turns at Ossington would have shortened the section of Dundas missing service due to construction. Steve: Moving a manhole is not straightforward as this provides access to a chamber underground. Depending on its location, the access may not be easily shifted. As for Ossington, the northwest corner is less than 90 degrees, and a south-to-west curve would be very tight. This coming up Sunday, November 23, streetcars make a welcome return to the “511 Bathurst” route, which has been using shuttle buses since Thanksgiving weekend (the buses used the same routing as streetcars for the first week). The track construction was originally set for completion on November 20th, but there was a slight delay due to wintry weather in Toronto. People have showed patience through this period of TTC track construction, and they rode on the buses to get to Exhibition Place for the Royal Agricultural Winter Fair, which just wrapped up on November 16. The return of streetcars comes just in time for the next even at Exhibition Place – the One-of-a-Kind Christmas Show and Sale, running from November 27 through to December 7. There’s another festival in the neighbourhood – the Frost Fair at historic Fort York, which the “511 Bathurst” streetcar makes stops both on Bathurst Street north of Lakeshore Boulevard, and on Fleet Street. Yesterday, I rode on the “511 Bathurst” streetcar – feels so good to see them return. I’d take one to the Exhibition Loop, located near Fleet Street and Strachan Avenue. For the first time since the first half of summer of 2012, both routes which ‘feed’ the Exhibition loop – the “511 Bathurst” and the “509 Harbourfront” are using streetcars. On the “511 Bathurst” route, they made their return yesterday with the completion of track reconstruction on the Wolseley Loop and the Bathurst-Dundas intersection; on the “509 Harbourfront” route, streetcars made their return during Thanksgiving weekend with the completion of the rebuilt tracks on Queens Quay West after more than two years (26 months) of curbside bus operation – streetcars were replaced with buses on Sunday, July 29th, 2012. 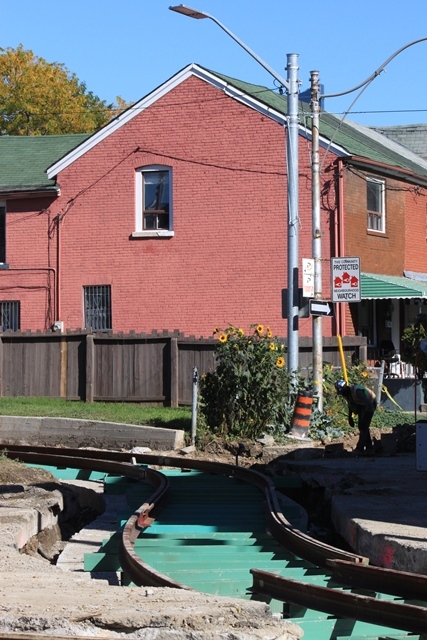 As you remember, last year (2013) – from Tuesday, September 3rd to Saturday, November 23 – the “511 Bathurst” route was using buses, because of track and watermain work. This meant for a brief period both the “511 Bathurst” and the “509 Harbourfront” route were using buses.